Ana Sequeiros Gómez was born in Madrid, Spain, in 1990. She´s an architecture student in the Escuela Técnica Superior de Arquitectura of Madrid and in the Gradevinski-arhitektonski Fakultet u Splitu in Split, Croatia. 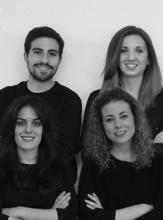 She has worked as an intern at differents architecture offices in Madrid such as Plan(t)ed and HT Arquitectos, and she is currently occupied on her Final Project. Concha García (Madrid, 1990), architecture student in the Escuela Técnica Superior de Arquitectura of Madrid. Early on, she was noted for her interest in drawing, being selected in several competitions at regional level. In 2013 she was selected to represent Spain at the meeting of architecture and design students (MEDS 2013) in Lisbon, focused on rehabilitating the neighborhood of Graça. This event influenced her considerably, so she is currently developing her Final Project about this theme. Javier Torres Navarro was born in Cadiz, Spain, in 1990. He´s an architecture student in the Escuela Técnica Superior de Arquitectura of Madrid and in the University of Liège, Belgium (2012-2013). He´s currently finishing his Final Project. He was intern in Doble G Arquitectos office and currently in Ghesa Ingeniería y Tecnología company. Passionate about photography, he was finalist, in 2004, in two categories in UrbanFlashMadrid photograpy competition of La Casa Encendida and second finalist, in 2015, in the Avanzado1 category of Alumni Department of Escuela Técnica Superior de Arquitectura of Madrid. She was born in Hellín, Albacete (Spain) in 1990. From an early age, her capacity for teamwork and creative attitude led him to participate in various educational projects and research at European level. In 2008, after completing his studies of Bachelor with honors, he moved to Madrid to begin studies in the Escuela Técnica Superior de Arquitectura of Madrid. She is currently working on the Final Project, combining it with complementary studies in architecture courses and participation in various architecture competitions.